Herbs, monoecious or subdioe-cious, (1.5-)3-9(-15) dm. 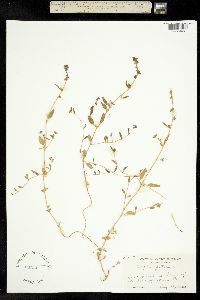 Stems mostly erect and branched, branches green, obtusely angled or striate, glabrate. 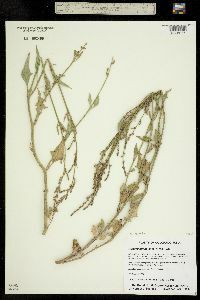 Leaves alternate except the proximalmost, petiolate; blade green on both sides, rhombic-lanceolate to lanceolate, oblong, or narrowly lance-oblong or hastate-ovate, 25-120 × 3-40(-75) mm, entire or toothed, proximal ones broadly cuneate or sometimes hastate subbasally with obliquely antrorse basal lobes, distal cauline leaves lanceolate and entire. Flowers compact or interrupted spiciform or paniculiform clusters. Staminate flowers mostly 5-merous. Fruiting bracteoles green becoming black, rhombic to rhombic-triangular, or ovate-rhombic, compressed, ± uniformly sized, 2-7(-20) mm, base mostly hastate, acute, margin united almost to middle, entire or sparingly toothed, surfaces tuberculate. 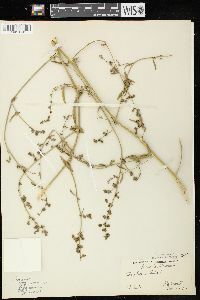 Seeds dimorphic: brown, 2.5-3(-3.5) mm wide, or black, 1-2 mm wide; radicle of brown seeds subbasal to median, antrorse. 2n = 36. Flowering summer-fall. 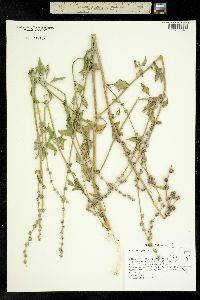 Widespread ruderal weed of nonsaline substrates such as fields, gardens, and roadsides; 0-2100 m; Alta., B.C., Man., N.B., Nfld. and Labr. (Nfld. ), N.S., Ont., Que., Sask., Yukon; Ala., Alaska, Calif., Colo., Del., D.C., Idaho, Ill., Ind., Iowa, Maine, Md., Mass., Mich., Mo., Mont., Nev., N.H., N.Y., N.C., N.Dak., Ohio, Pa., R.I., S.Dak., Utah, Vt., Va., Wis., Wyo. ; Europe; Asia; n Africa. 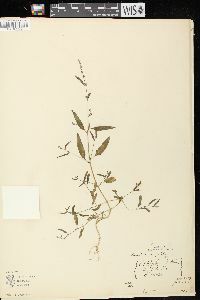 Atriplex patula appears to have been a rather recent introduction in North America from Eurasia, not arriving perhaps until sometime in the early to mid-eighteenth century. 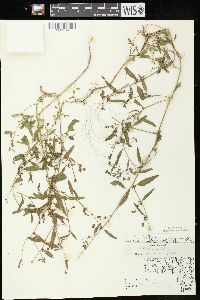 It simulates depauperate specimens of A. dioica, A. glabriuscula, and other similar species when leaves are reduced to a near-linear profile. 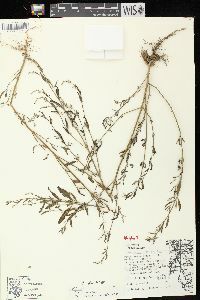 Such specimens are difficult if not impossible to assign to any of the species. Annual herb 30 cm - 1.5 m tall Stem: upright, widely branched, branches green and angled or grooved. Leaves: alternate (except lowest ones), stalked, 2.5 - 12 cm long, 3 mm - 4 cm wide, lance-shaped to diamond-shaped or narrowly oblong lance-shaped to arrowhead- egg-shaped, sometimes sparsely toothed, more or less mealy. Inflorescence: a compact or interrupted spike of flowers or a branched cluster of flowers (panicle), numerous. Flowers: either male or female, borne on the same plant (monoecious), greenish, tiny. Male flowers with five sepals and stamens, no petals. 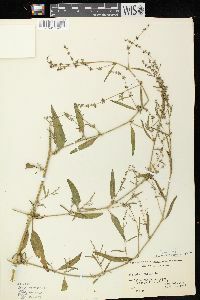 Female flowers without petals and sepals, enclosed within a pair of small, leaf-like bracts (bracteoles). Stigmas two. Fruit: enclosed within a pair of small bracts (bracteoles). Bracteoles united almost to middle, green becoming black, mostly 2 - 7 mm long, diamond-shaped to triangular or diamond- egg-shaped with an arrowhead-shaped base and pointed tip, compressed, sometimes sparingly toothed, smooth or with small, irregular projections. 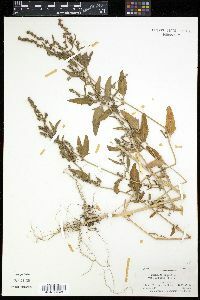 Seeds brown and 2.5 - 3.5 mm wide or black and 1 - 3 mm wide. 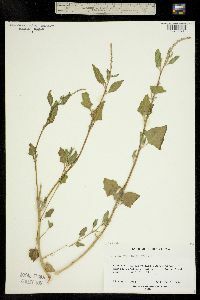 Similar species: The similar Atriplex prostrata differs by the shapes of its leaves, which are often toothed. 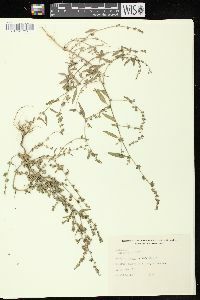 Etymology: Atriplex is the ancient Latin name for this plant. Patula means spreading.